Josielyn Bustamante plans to become a civil engineer, in order to help others. Financial barriers have created challenges for her, but she has worked hard to overcome them. 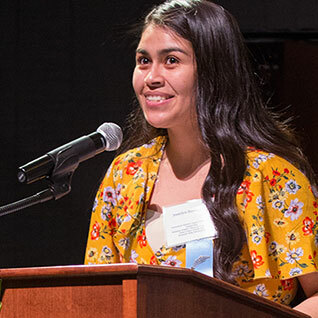 Josielyn was particularly interested in the Kennedy-King Memorial Scholarship, a $10,000 award for students who have unmet financial needs and come from under-represented minority groups. In addition to the application, applicants must provide three letters of recommendations and complete an interview. Josielyn had to do all this while also doing her school work, looking for internships and applying to four-year schools. Josielyn won that Kennedy-King Scholarship, as well as the ASU Achievement, Dean Lesher and Brandon Schnurr Memorial Scholarships from the CCC Foundation. This fall, she will begin pursuing a bachelor’s degree in civil engineering at California Polytechnic State University.